Recipe: Soto ayam, the world’s best chicken soup! But all is not awfulness, because at least I have an excuse to make my favorite chicken soup–which, since 2011, has been soto ayam. (Sorry, matzo ball!) With its super-flavorful, coconut-milk-thickened broth filled with chicken, rice noodles, and crunchy sprouts and scallions, it’s not just the only chicken-noodle soup I’ve ever really gotten excited about; it’s one of the best dishes, period, that I tried during my world travels. The way I make this soup at home is in the style of the little roadside stall in Labuan (western Java) where I first tried it. Apparently, soto ayam varies by region in Indonesia, so when I returned to the states and wanted to learn how to make it, I had to sift through many different recipes. After a few rounds of experimentation, though, I finally developed this master recipe, which is very true to my memory of the soup I had in Java. It’s a bit of a project, but completely worth the effort, in my opinion. If you try it, let me know what you think! 1) Combine broth ingredients in a large pot. Bring to a boil, then simmer for 40 minutes, partially covered. Remove chicken thighs and set aside to cool. Discard lemongrass stalks (if used). Reserve broth to use later in the recipe. 2) Combine spice paste ingredients in a food processor. Process for about 5 minutes, or until a thick paste has formed. 3) Once chicken thighs are cool, remove the meat from the bones and shred it. Discard the bones. 4) Heat 2 TBSP oil in your large pot on medium-high heat, and add spice paste. Fry spice paste for 5 minutes, stirring almost constantly. Add coconut milk, reserved chicken broth, and shredded chicken; bring to a boil and simmer for 5 minutes. Add bean sprouts and cook 5 more minutes. Add spring onions and cook 1 minute. Turn off heat. 5) Meanwhile, boil a pot of water and cook rice noodles according to package directions. When ready, drain, rinse with cold water, and mix in a little oil to keep noodles from clumping. 6) To serve: divide rice noodles among four bowls and ladle soup over them, making sure to get a good mix of solids and broth. Serve with a spoon and either chopsticks or a fork. Enjoy! ALL FOUR STARS is out in paperback today! Happy April 7–otherwise known as the paperback release date for my first novel, All Four Stars. I’m incredibly excited about this for several reasons. I am Puffin, hear me roar!! 3) That Puffin logo! 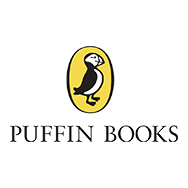 Thinking back again to all those paperbacks I read as a kid, the Puffin logo was a stamp of the highest quality, since it graced the covers of my Judy Blume and Roald Dahl volumes. 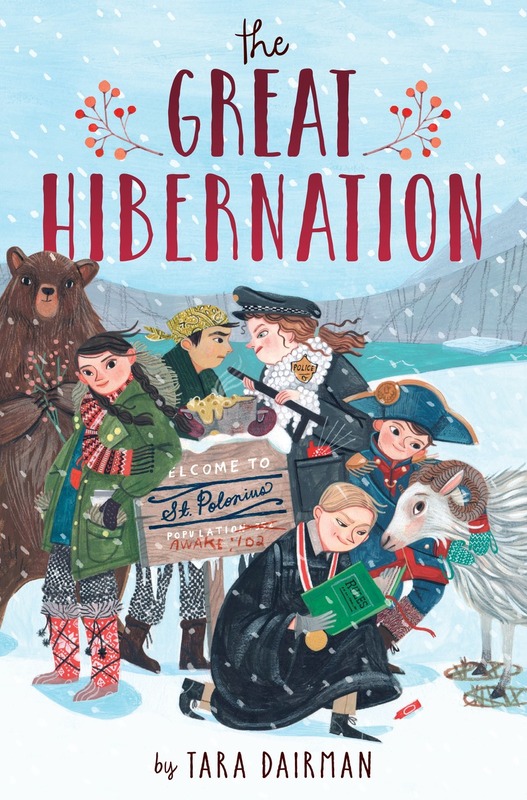 Of course, I had no idea about publishers and imprints back then–but now I know that Puffin publishes the paperback editions for Penguin Young Readers books. Which means that it appears on the All Four Stars paperback! I seriously could not be more delighted about that. So, many thanks to Puffin editor Jennifer Bonnell for making the transition from hardcover to paperback so smooth, and many thanks to all of you readers, without whom Penguin would not have decided to release a paperback at all (not every book gets one) and continue the All Four Stars series. If you spot an AFS paperback in the wild, feel free to snap a pic and tweet or send it to me–I’d love to see it out there! 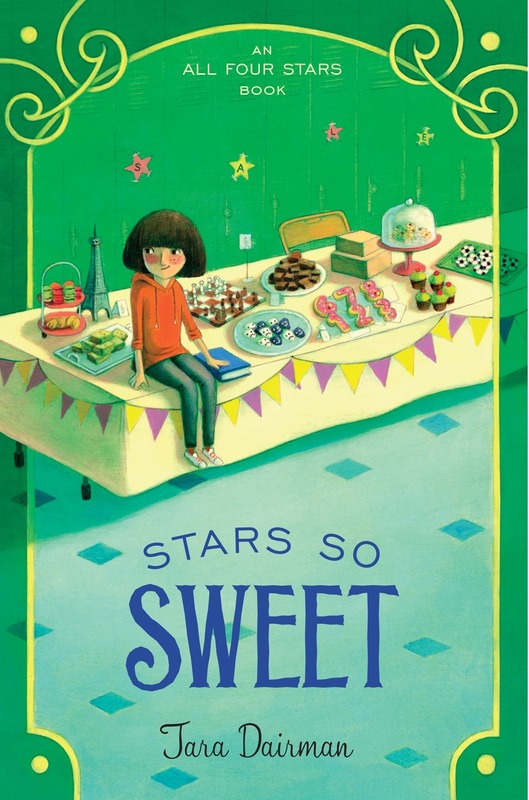 It’s the last day of Emu’s Debuts launch week for All Four Stars, featuring a recipe for “Amazeballs” by Megan Morrison! Yum! And in case you missed them, there was also an interview with cover artist Kelly Murphy (featuring alternative cover sketches!) and a hilarious compendium of Emu kitchen disasters. Comment on any post for a chance to win a signed hardcover–winner announced on Monday! My fabulous friend and fellow debut author Jessica Lawson (whose The Actual and Truthful Adventures of Becky Thatcher I adore) is also giving away a copy of AFS to a lucky commenter! Heidi Schulz (whose debut MG novel Hook’s Revenge comes out this fall!) has me at her blog with an “In the Middle” interview! 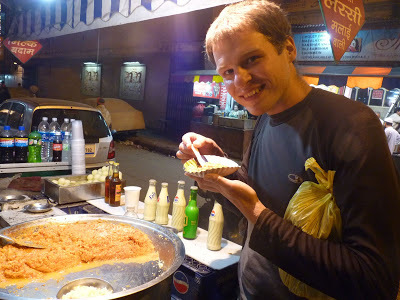 Find out which dessert in AFS is my favorite. I was also interviewed by restaurant critic John Lehndorff yesterday on Boulder KGNU’s “Radio Nibbles”! The five-minute chat starts at 25:45. Finally, I’ve posted pictures from both my 7/10 NYC launch party at Books of Wonder and my 7/17 Boulder launch party at Boulder Book Store at my author page on Facebook. Launching All Four Stars has been a wild, wonderful ride so far, and I’ll try to gather my thoughts on the entire process at some point in the coming weeks. But for now I’ll just say THANK YOU SO MUCH to everyone who has supported me and my first book in person and online over this past week. I’ve been so honored and humbled by your enthusiasm for my work. Read deliciously! Happy July 4 to all who are celebrating! 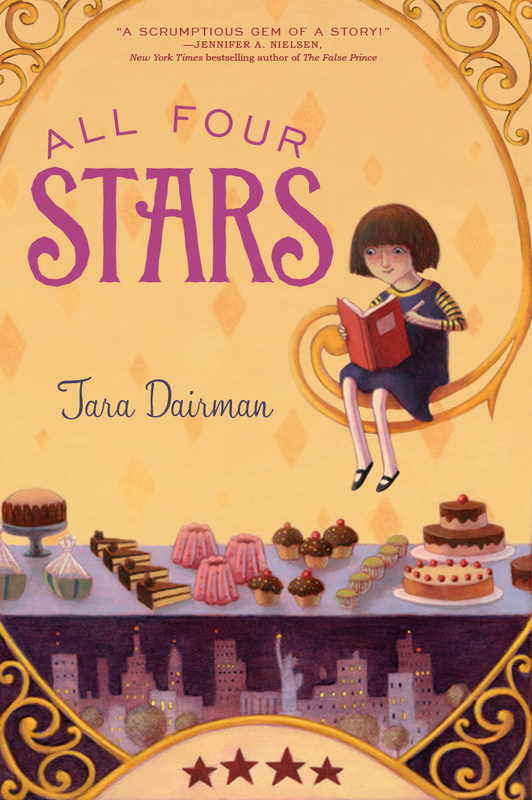 Today was the fourth stop on the official All Four Stars blog tour, and a great day for recipes. Over at A Baked Creation, Sylvia has created a crème brûlée recipe inspired by the opening scene from the book! Check out her beautiful pictures. 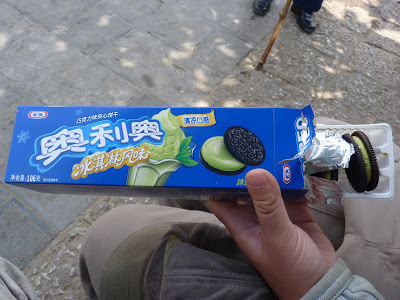 As a bonus, it’s flavored with osmanthus (which, I admit I had to look up. It’s a flower that tastes like peach or apricot–yum!). AND, over at Spirit of Children’s Literature, Katie has concocted a recipe for “Mrs. Anderson’s Aztec Brownies with Caramel Walnut Glaze,” inspired by the experimental brownies that Mrs. Anderson bakes (and Charissa adores) in All Four Stars. These have ancho chile powder and ground ginger in them, and look absolutely amazing! I can’t wait to try these recipes, and will be linking both of them from my own four-star recipes page for the future! Hope you had a delicious day, and I’ll check back in on Monday with the next stop on the blog tour and the winner of The Actual & Truthful Adventures of Becky Thatcher by Jessica Lawson! Classy Cakes–the fictitious “dessert bistro” that Gladys is assigned to review in All Four Stars–is famous for its delicious, internationally-inspired cakes. As for how I decided to write about such cakes…well, if you guessed I was inspired by my travels, you’d be correct! Sesame pops up a lot in Chinese cuisine. 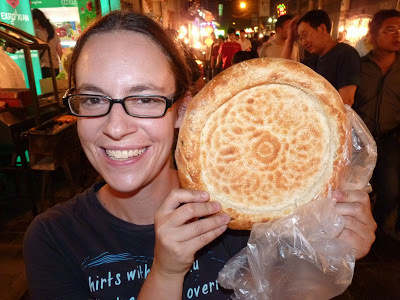 Here I am with a giant sesame bread (kind of like a sesame bagel without the hole) in the market in Xian. 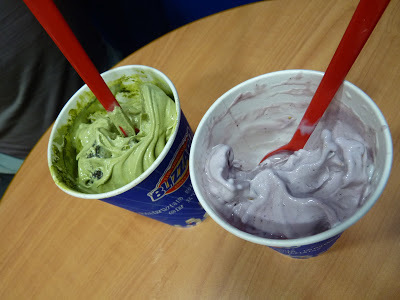 …and this green tea Blizzard (yes, there are Dairy Queens in China!). If you are a young chef, ask an adult to work with you on this recipe. Preheat the oven to 350 degrees. Grease a muffin tin or line it with cupcake cups. Mix flour, baking powder, salt, and matcha green tea powder in a bowl. In another bowl, beat eggs, sugar, and oil together with an electric mixer on medium speed. Beat in milk and vanilla extract. Add the dry ingredients to the wet ingredients and stir until just combined. Pour batter into muffin wells until they are 3/4 full. Bake for 20 minutes (or, if you’re at high elevation, bake for 17 minutes at 365 degrees). Let the cupcakes cool completely before removing them from the muffin tin and icing. To make the icing: Cream the butter and cream cheese together with an electric mixer until fluffy. Beat in the tahini, then gradually beat in the powdered sugar until well-incorporated, alternating with a little milk. 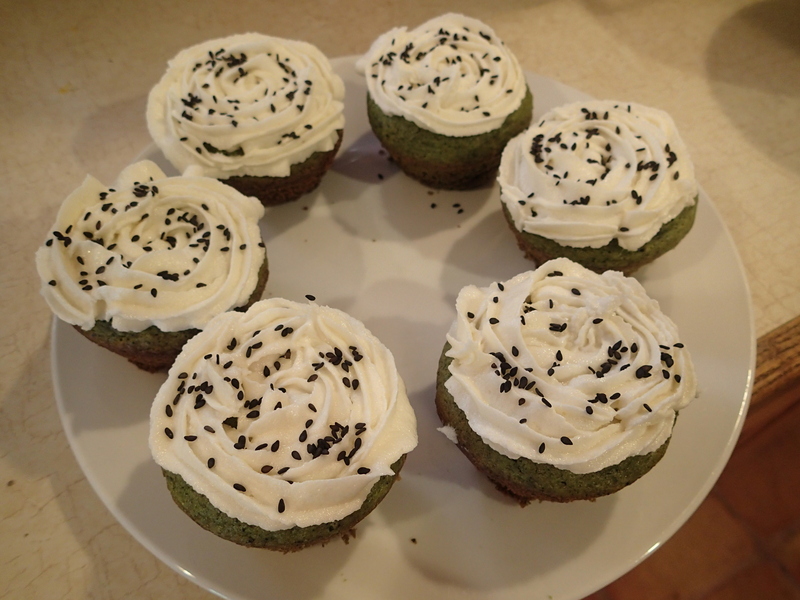 Pipe the icing onto the cupcakes and garnish with black sesame seeds. This recipe is part of a series inspired by dishes from All Four Stars, my middle-grade novel about 11-year-old restaurant critic Gladys Gatsby. It will be published by Putnam/Penguin on July 10, 2014. Find more recipes on my four-star recipe page! “What’s gajar ka halwa?” Gladys was intrigued. “It’s a traditional north Indian pudding made with carrots,” Parm said. Parm Singh is right. Move over, carrot cake–gajar ka halwa is the tastiest sweet dish made with carrots you could possibly imagine! In India, this dessert is often made with a special red variety of carrot, which doesn’t really affect the flavor, but makes the dish even prettier to look at. 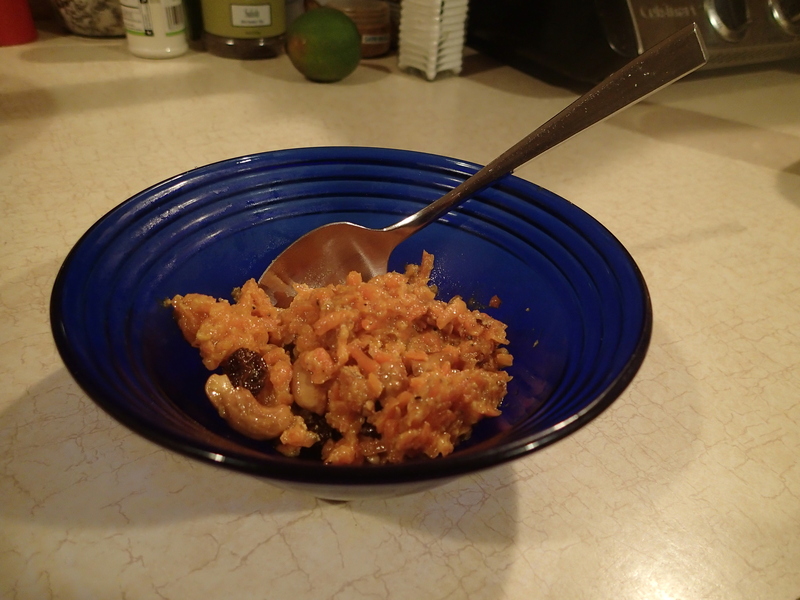 In any case, when I needed to come up with an Indian dessert for All Four Stars that picky Parm would actually like and want to teach Gladys to make, gajar ka halwa was the obvious choice! Here’s my version of the recipe. -Traditionally, one would use ghee (clarified butter) as the fat, but don’t worry if you don’t have any on hand–I’ve made it with plain old butter and it has still turned out delicious. -Also, this recipe contains extra nuts, since Charissa loves them, but if you don’t or are allergic, they are easy to omit. In a large, deep skillet (preferably nonstick), melt 1 Tbsp ghee or butter over medium heat. Add the cashews and almonds and toast until the nuts are golden-brown and fragrant, 4-5 minutes. Add the raisins for the last minute and cook, stirring, until they are plumped but not burnt. Remove the nuts and raisins into a bowl and set aside. Melt the remaining 4 Tbsp ghee or butter in the skillet. Sautee the shredded carrots in the fat for 3-5 minutes. Add the milk, bring the mixture to a simmer, and cook until the milk is all evaporated, about one hour. Stir in the sugar and cardamom and cook for another 3 or 4 minutes, until the sugar is melted and well-incorporated. Taste and add more sugar as desired. Before serving, stir in the nuts and raisins, or reserve as topping. Serve warm, at room temperature, or cold in small bowls (a little goes a long way). Why yes, Charissa–there is such a recipe! To get the traditional straight-sided tart shape, you’ll need a springform pan–either the standard size (for one big tart) or four smaller pans (which I used to make the tarts pictured). However, if you only have a pie pan, that should work, too. 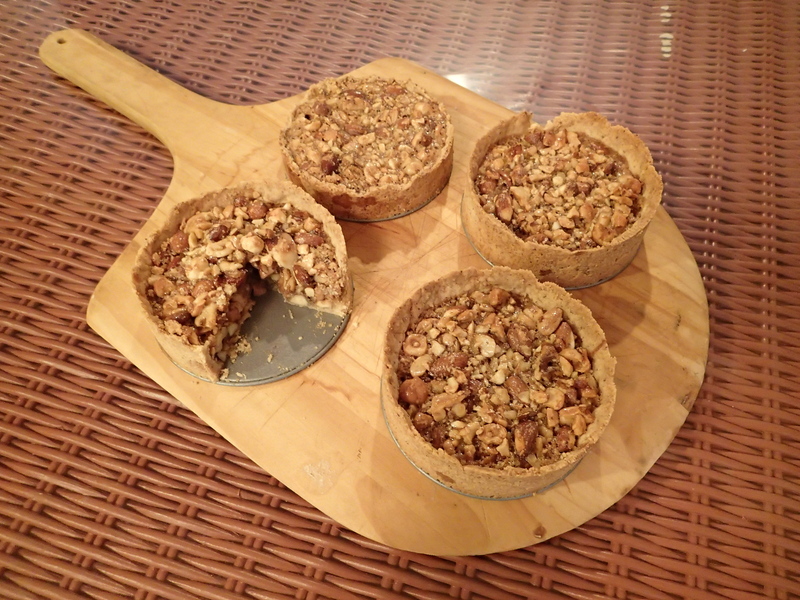 Note: If you want to be all posh like Allison Sconestein-Alforno (pastry chef at Classy Cakes in All Four Stars), you can seek out fancy nut varieties to include in your tarts–her menu boasts a mix of black walnuts, Marcona almonds, and DuChilly hazelnuts for the filling. But regular old nuts from the grocery store will work just fine, too, as long as you have a good mix. Preheat the oven to 400°F. Lightly grease one large springform pan (for tart version), four small springform pans (for small tarts), or a pie pan (for pie version) with oil or cooking spray. In a food processor, pulse the almonds and sugar together until they form a coarse meal. Add flour and salt and pulse to blend. With the motor running, add the butter a few pieces at a time and process until well blended. In a bowl, beat the egg yolk and extracts until combined. With the processor motor running, add this mixture to the food processor. Process until a sand-like mixture forms (about 1 minute). Turn the mixture out into the prepared tart (or pie) pan or pans, pressing it into the bottom and up the sides to form a crust. Place pan(s) on a baking sheet and bake for 12 to 14 minutes, until the crust is no longer raw. Meanwhile, make the tree-nut filling. In a food processor, pulse the nuts together a few times until they are chopped to the size you prefer. In a large bowl, whisk the eggs, maple syrup, brown sugar, oil or butter, salt, and vanilla extract together. Pour the nuts into the liquid mixture and stir until combined. Remove the tart crust from the oven and reduce oven temperature to 350°F. Spread the nut mixture evenly in the crust. Bake until the tart no longer jiggles in the middle when shaken, 25-30 minutes. If using a springform pan, cool tart on a wire rack for 20 minutes, then gently remove the sides of the pan. If using a pie pan, let cool to desired temperature.